Join Us for the 2013 Sprinklerama! 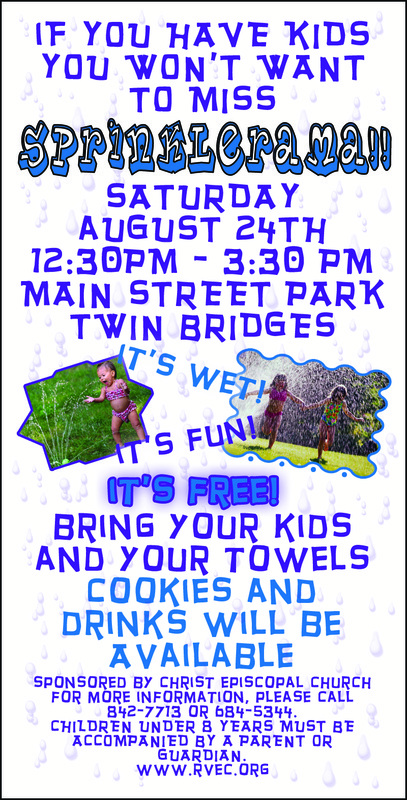 This summer, Christ Church has planned an afternoon event to cool off the kids and bring families together to enjoy some time at the Main Street Park in Twin Bridges. On August 24th from 12:30pm to 3:30pm, Christ Church is sponsoring SPRINKLERAMA. We will have lots of sprinklers for kids to run through, soak in and just cool off. Drinks and cookies will also be provided. Just bring some towels and your kids and plan for a relaxing atmosphere where you can catch up with your friends, and maybe take a run the sprinklers! Children under the age of 8 must be accompanied by a parent or guardian at all times. For questions or additional information, please call 842-7713, or Deacon Janis at 596-5267, or Debra at 684-5355.